I grabbed my brown hounds-tooth coat, hat, scarves, and gloves from the hook near my bed. It was going to be a cool night. I shivered not so much from the expectation of cold, but from the excitement. Sophie, Charlotte, and I had just finished an impromptu mac ‘n’ cheese dinner in my kitchen and we were all going to head into town for the last night of Lumiere. Charlotte and I had been two nights before, but the stress of the crowds and the stress of trying to keep our group together had made it difficult for us to really enjoy the installations. Tonight we would have no distractions. The three of us were determined to see as much as we could in the two hours we had before it closed. We set out from Fisher and headed out towards the familiar route to the Science Site. 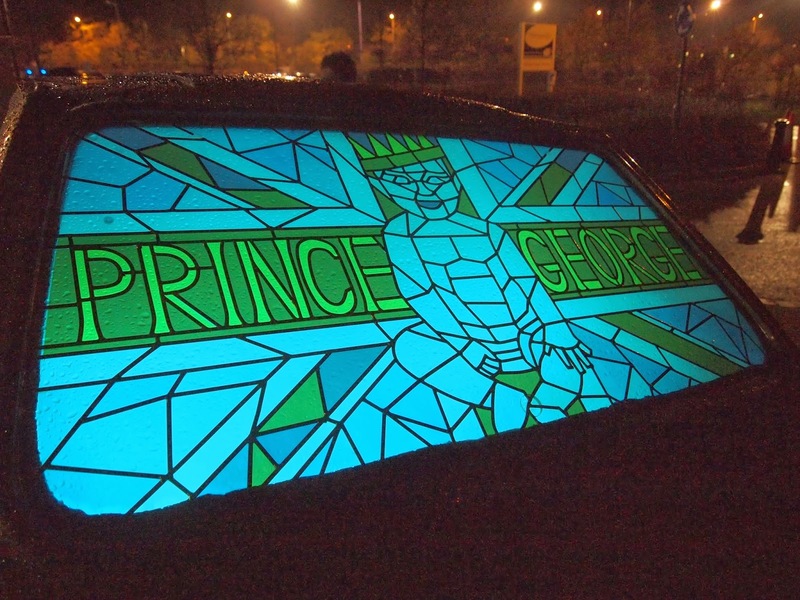 Near the roundabout we came to the first installation: a reconfigured Robin Reliant with stained glass windows depicting English celebrities. 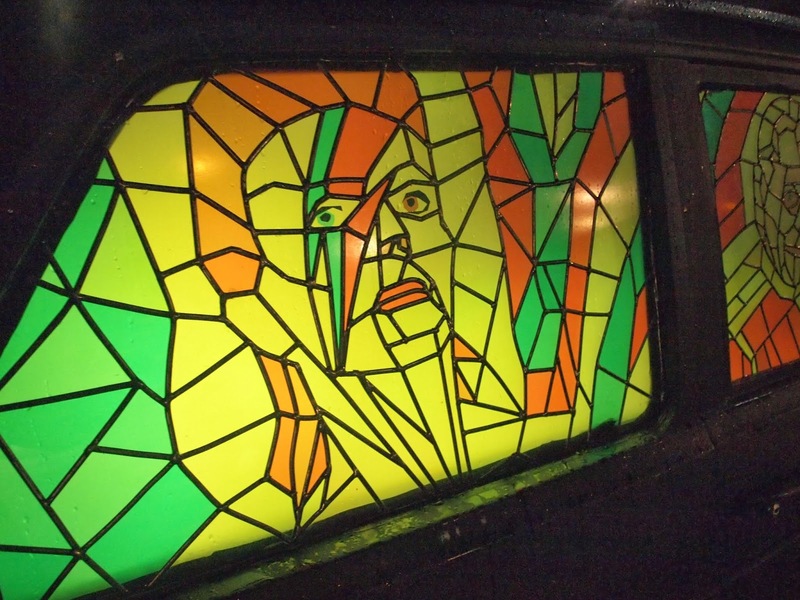 It was lit from within and gradually changed colours. It was one of the more practical uses I’ve seen for the otherwise useless Robin Reliant. I wondered silently if it had been placed at the roundabout as some sort of joke, an artist or event organiser taking the piss at the Reliant’s complete inability to negotiate turns of any sort. what more could you want in your art? As we continued onward, we bumped into Emily, a conservation student on the same course as Charlotte. It didn’t take much convincing for her to decide to join us on our expedition. So our crew of three became a crew of four and we chatted to one another as we strolled into town. Speculations over the displays had been mounting for weeks as we all saw pieces of the installations going up around town. A huge castle wall had been erected across Elvet Bridge. 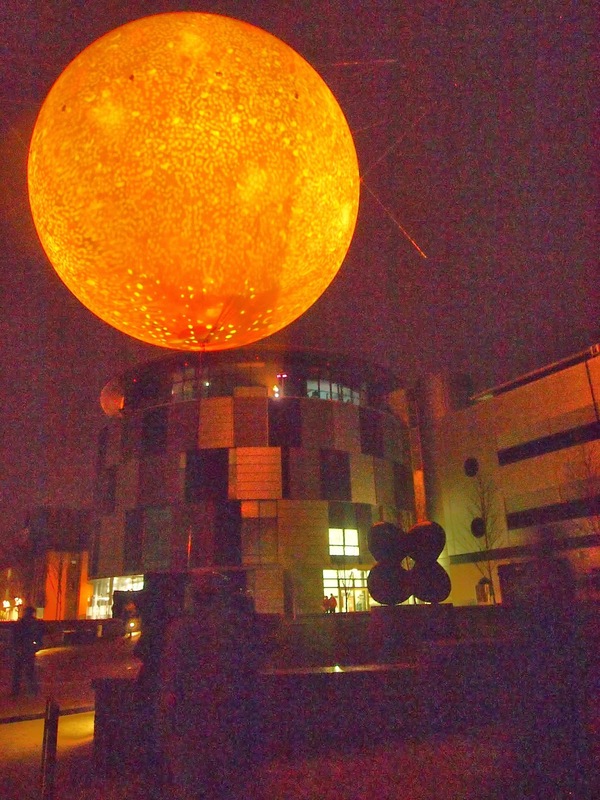 A mysterious inflatable sphere had been raised between the Dawson Building and Calman Learning Centre. Some of us had even caught site of the installations being tested before the opening and everyone had been talking about what they had seen. 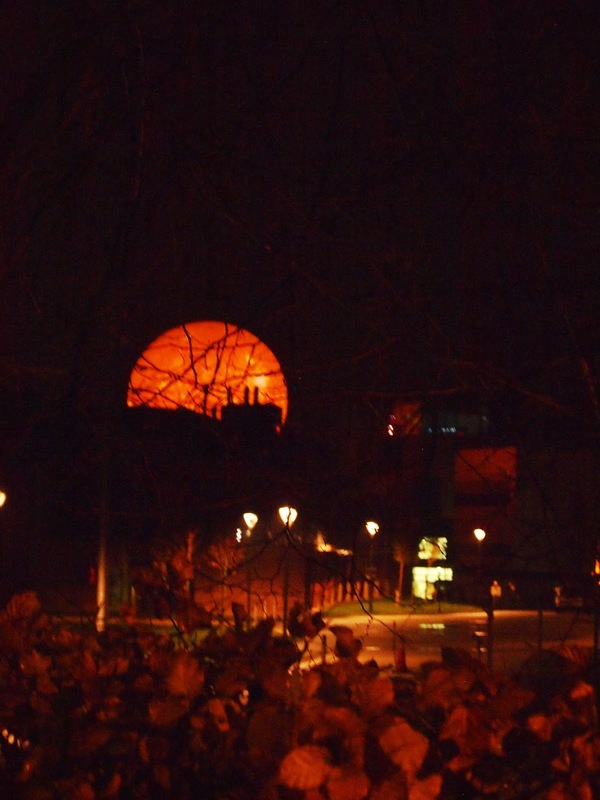 Those who had late lectures on Thursday, the first evening of the festival regaled us with tales of a disturbing eye, not unlike the Eye of Sauron, accompanied by demonic chanting at the Science Site. As we neared the site again, I got to experience seeing it for the first time through Sophie. Arising between the buildings a short distance from us was the sun. I assure you we hadn’t walked until dawn. The mysterious, floating sphere was a scale replica of the sun. It pulsated with orange and red flames underpinned by a constant, rhythmic wash of the sounds of the universe. This was one of my favourite installations. It played into my wannabe astrophysicist fantasies and where better than to pretend than on the Science Site at Durham University? Night becomes day at Lumiere. We left the sun and approached the library. 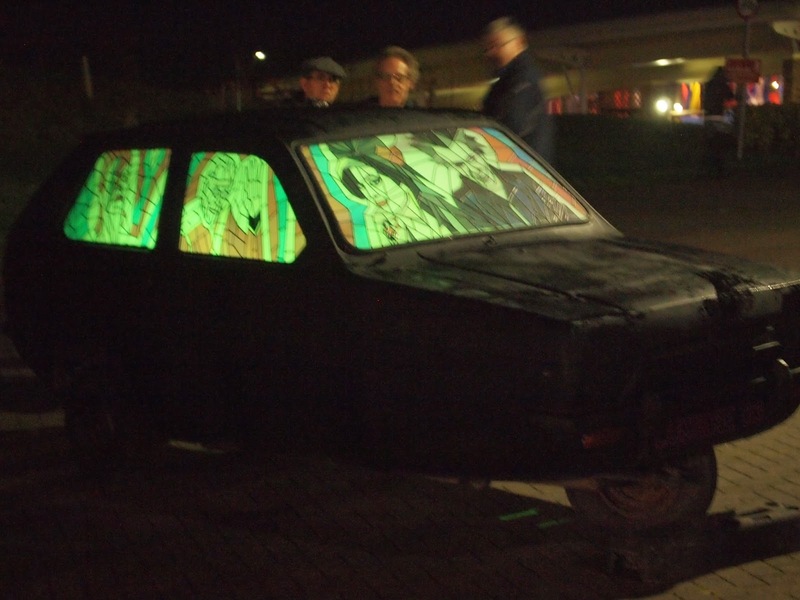 Here was one of the more…eccentric installations. It had generated the most buzz in our programme. 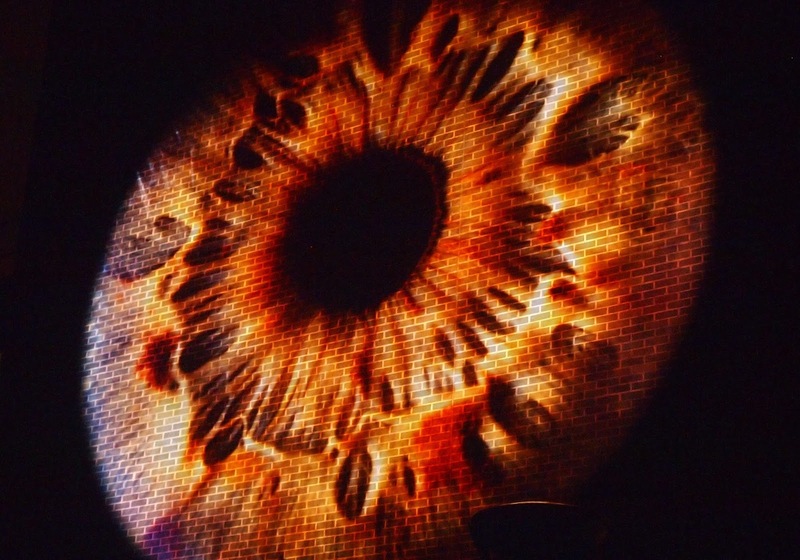 An eye was projected onto the brick wall of the library. What followed was reminiscent of an experimental film with a hodgepodge of images strung together accompanied by a soundtrack which would have been at home at a meeting of your local chapter of Satanists. We pushed onward, hindered only by the slow moving hoards in front of us. At one time or another each one of us had expressed our disdain for the slow moving throngs of people on the sidewalks or for the odd person who would stop abruptly right in front of you for seemingly no reason at all. Despite this, we made it to St. Oswald’s churchyard. 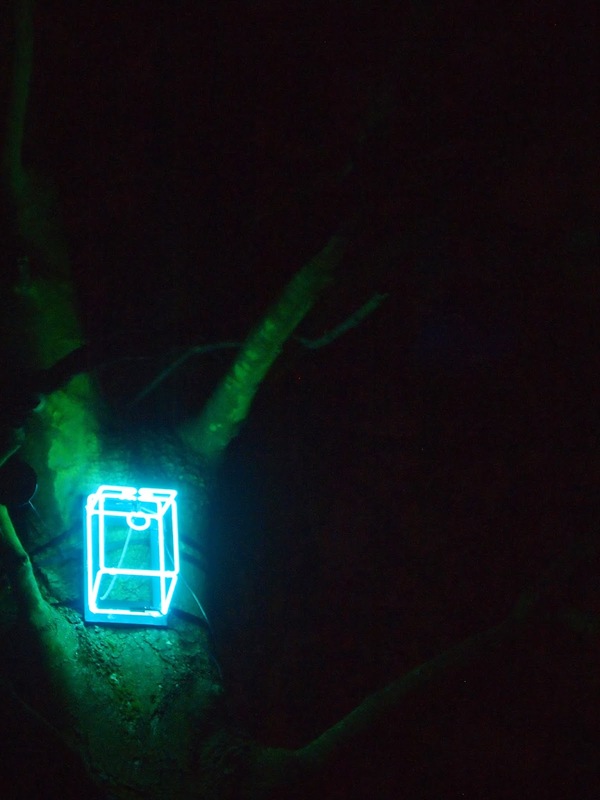 By day it was a nature preserve, now at night, in the realm of Lumiere, it was home to recorded birdsong and neon birdhouses. It’s a bit drafty, but it’s home. We emerged from the cemetery determined to head into the city centre to Market Square. We neared Elvet Bridge and found that the crowds were much more manageable than they had been two nights ago. 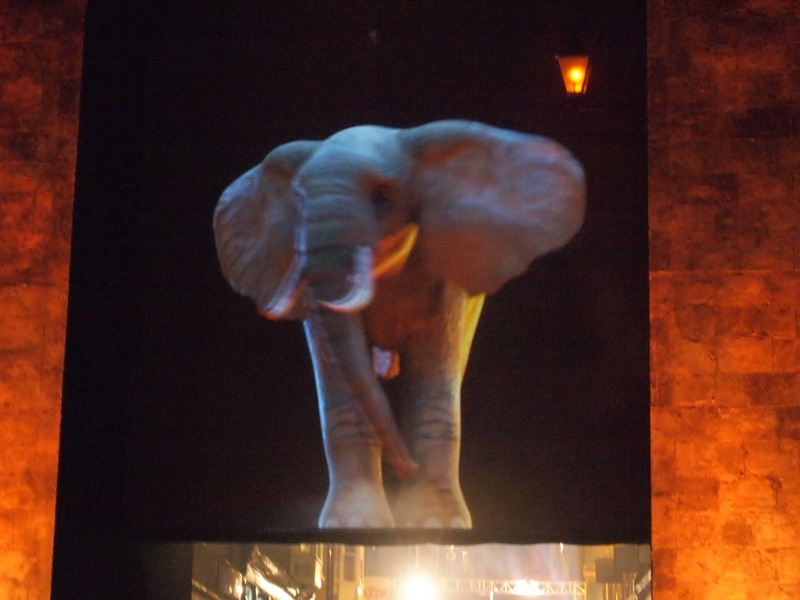 We began to hear irregular rumblings and occasional trumpeting sounds before we rounded the corner to the bridge. 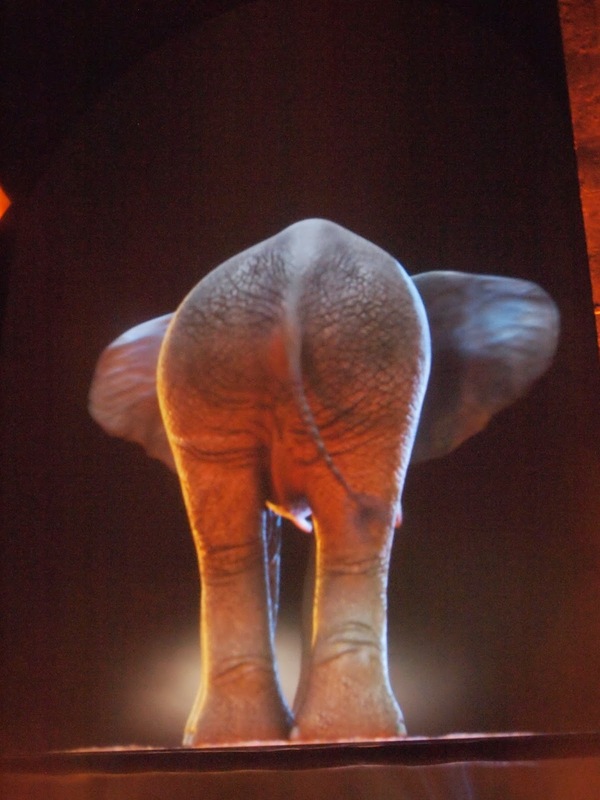 There, on a black screen within the archway of the faux castle wall was a giant CGI elephant. He stamped his feet in place and bellowed at the passers-by under his feet. We lovingly nicknamed him Peanuts and posed for photos as we continued through the arch. Peanuts is none to pleased. 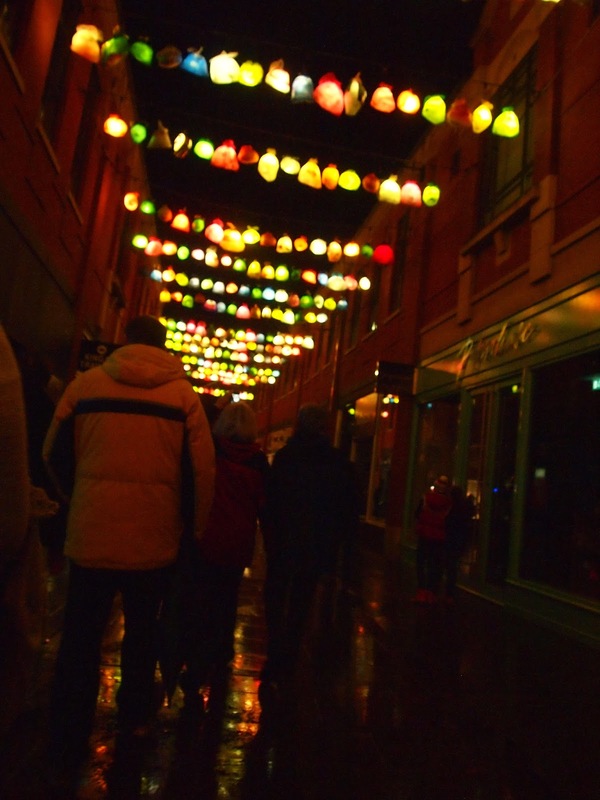 The installations in town seemed to flow one after the other. 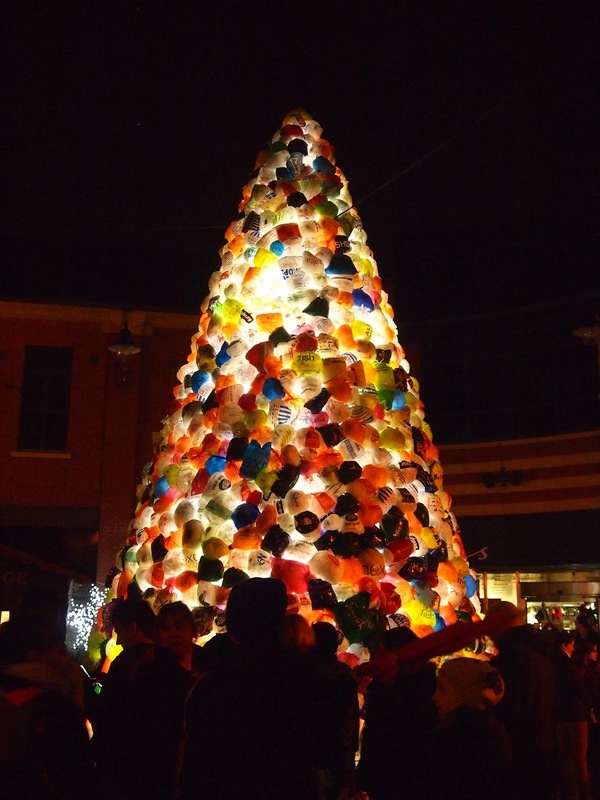 There was the lit Christmas tree made from plastic bags, the “Place Beyond Belief” sign above the entrance to North Bailey, and the fish tank phone box. We stopped for some much needed mulled wine and hot chocolate as we climbed North Bailey towards the Cathedral. 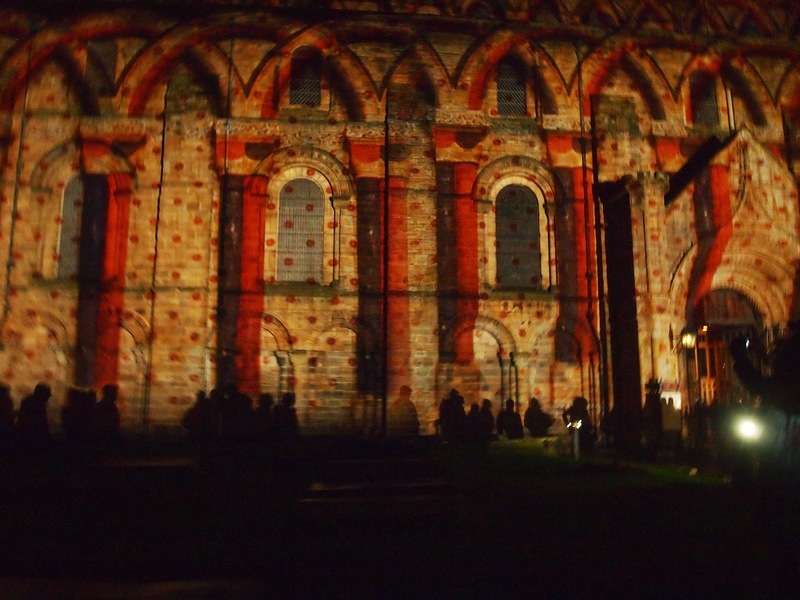 Two nights ago we hadn’t been able to get inside the Cathedral for the long queues. We had made up our minds to get inside at all costs. Trash bag Christmas, an obvious sign, and a fish tank phone box. 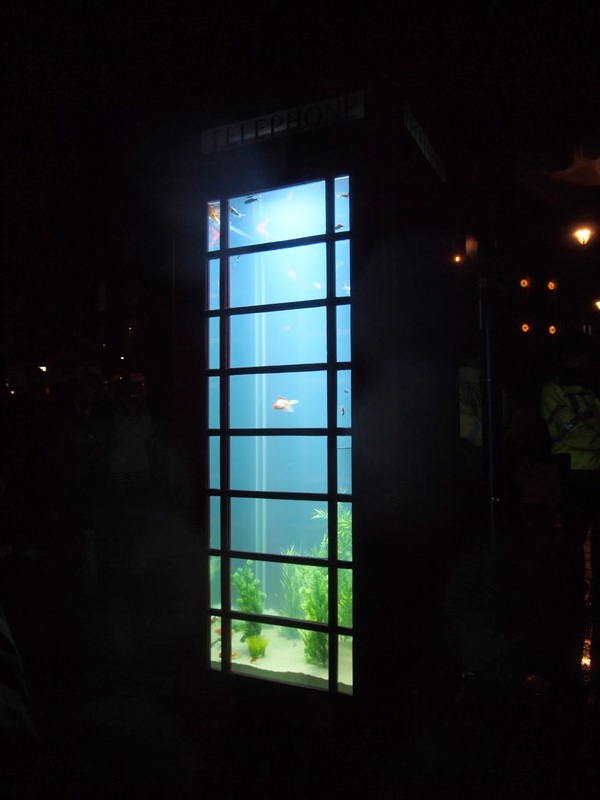 Okay, I actually really want a fish tank phone box. 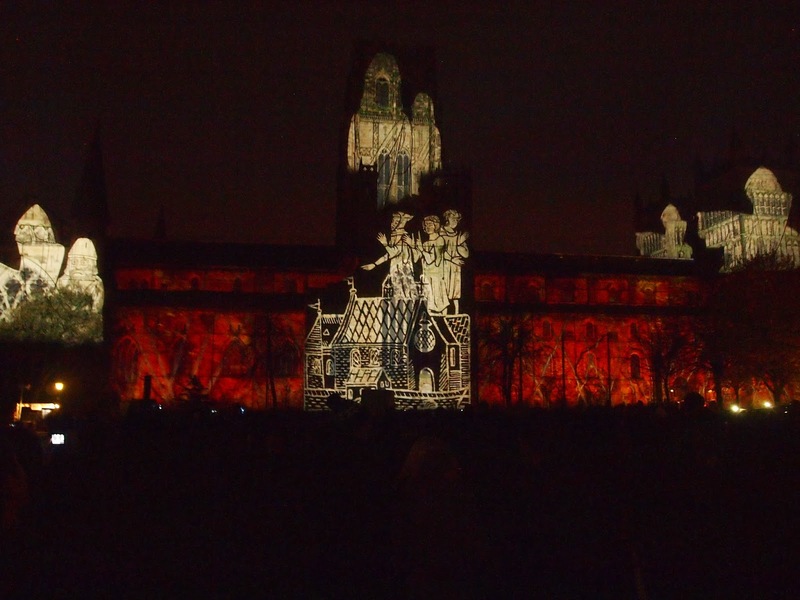 The site of the Cathedral completely lit in patterned lights greeted us as he reached the top of Palace Green. 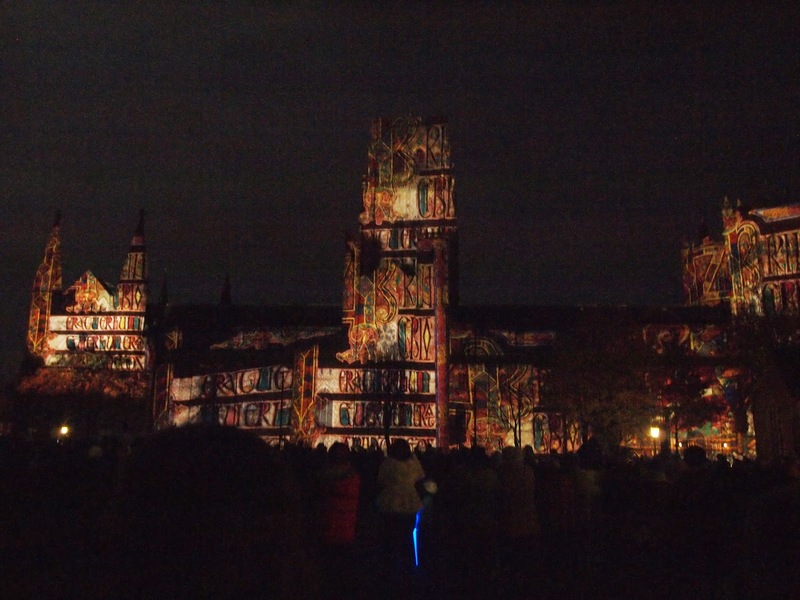 The show began and hundreds of patterns floated across the face of the building, telling the story of Durham, the Lindesfarne Gospels, and the building of the Castle and Cathedral. I looked over and saw an even more miraculous thing: there was no queue to get inside. We hurried over and made our way through the labyrinth of barriers all the while watching the dance of light across the ancient stonework. Finally, we made it inside. It seemed as though hundreds of ghostly orbs were dancing above us as we walked down the centre aisle toward the altar. Circles of light delicately swam over us. It was as though the room had been placed under an enchantment. It was one of the most beautiful things I had seen. 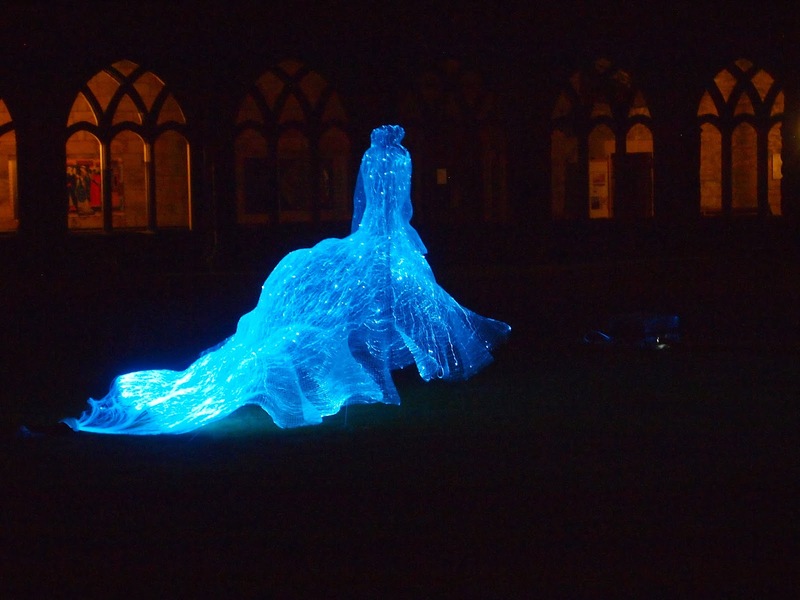 We reached the cloisters and found ghostly ball gowns lit in the centre courtyard. As we watched they began to change colours from red to yellow, from yellow to green, from green to a rich teal and blue and finally to purple. 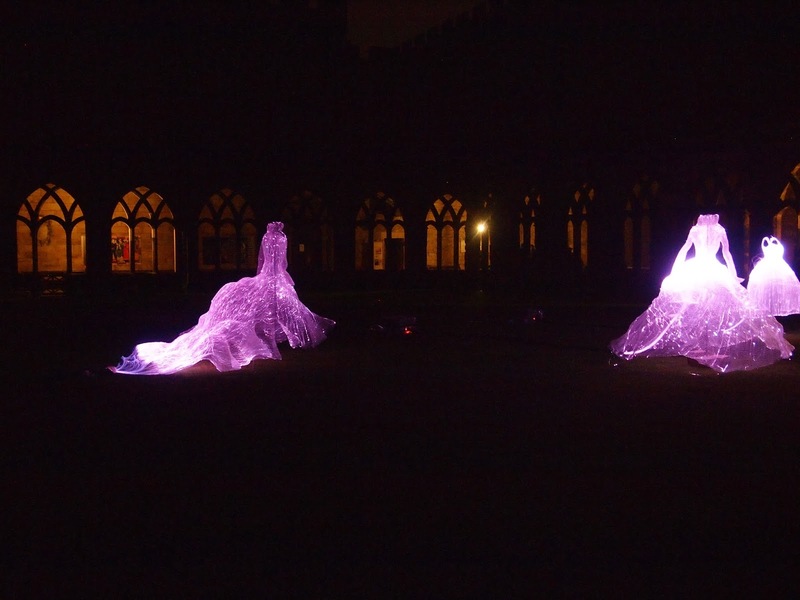 The Durham Cathedral light show and a ghostly waltz. It was understandable. She had worked that weekend and had driven back and forth between home and Durham. The three of us walked as far as the turning for the bridge and wished her a good night. There was one more installation we wanted to see and it was at the north end of town. We crossed the Framwellgate Bridge and left the Peninsula. 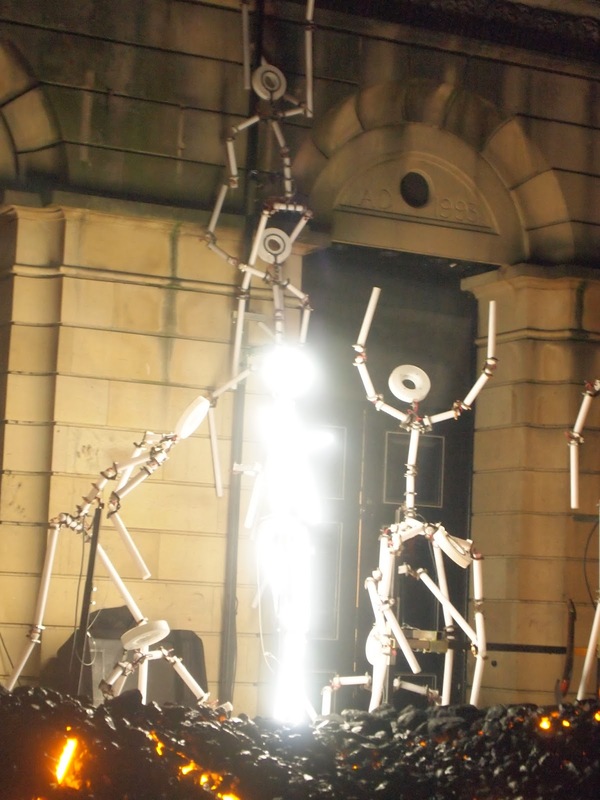 At the site of the Old Miners Hall, fifty or so white stick figures clung to the walls. They lit up in turn in a coordinated dance sequence. As we watched the show a light rain began to fall. After an explosion of white stick figures faded into darkness, Sophie, Emily, and I turned to walk back up to Howlands. Some stick figure miners rocking the house. The rain continued to fall softly over us, but we were too content with a fun evening out to notice much or care. 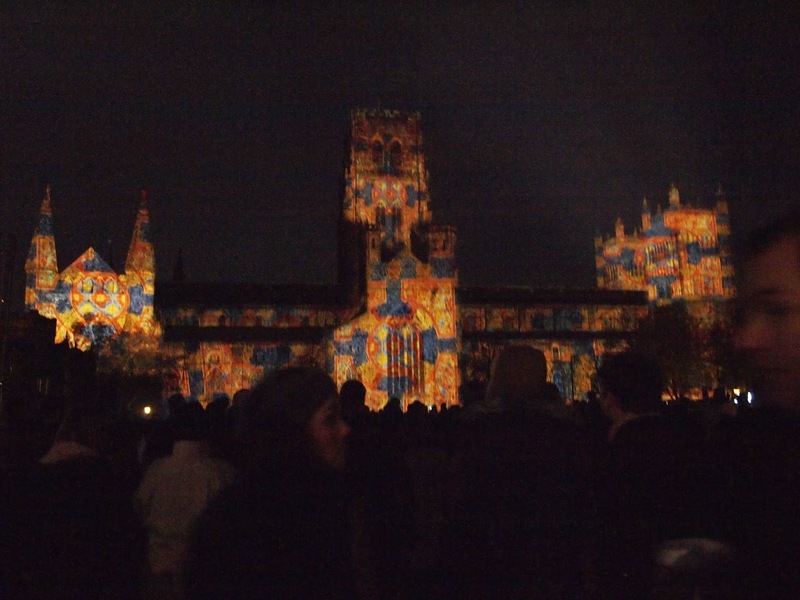 Lumiere only comes to Durham every two years and we all felt lucky to have been here at this exact time. I remembered a phrase coined by my friends from undergrad, Right here-right now moment. 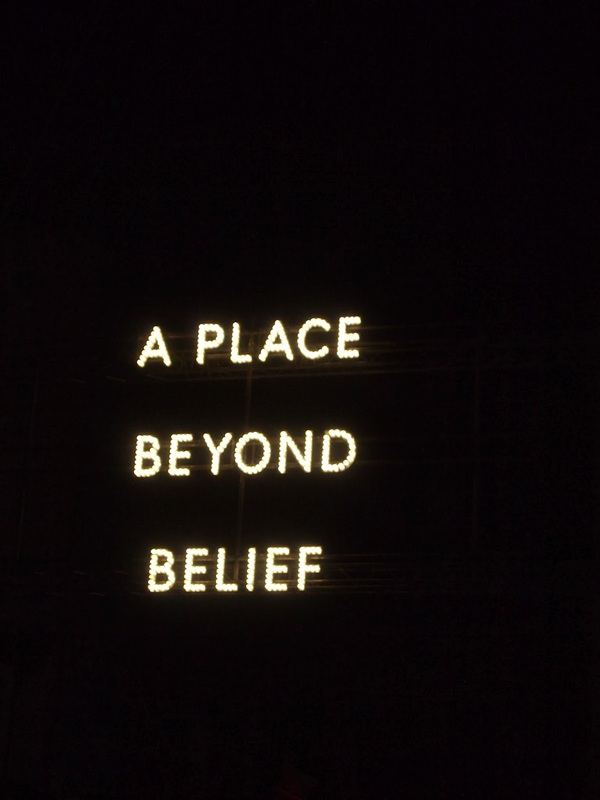 It’s for those times that you realise there is nowhere else and no when else you would rather be. 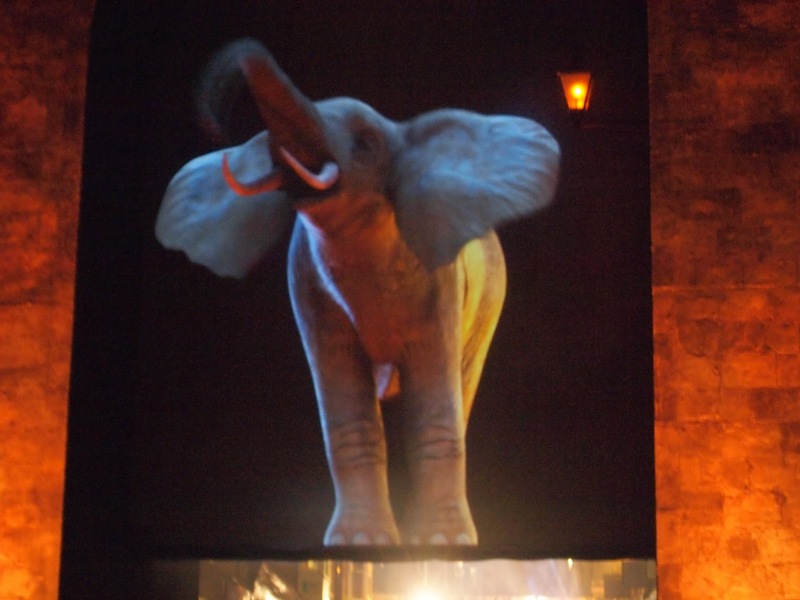 That was Lumiere for me on that drizzly Sunday night. Right here-right now. Did Josh say that “right here right now” moment thing? I'm pretty sure he did. I've completely forgotten about it. You know where I would LOVE to see those ballroom lit up ghosts? The church on Gov Island! Governor's Island would be a brilliant place for a light installation!